What Is Plantar Fasciitis and What Are the Causes? How to Select the Ideal Work Boots for Plantar Fasciitis? Plantar fasciitis is caused by straining the ligament that supports the arch of your foot and is the most common cause of heel pain. Continuous strain from standing and walking (particularly on hard surfaces) can cause this ligament to swell and become irritated. If you suffer from plantar fasciitis, you are aware of how important it is to find footwear that can accommodate your condition comfortably. Because of this, we have researched and provided reviews of the best work boots for plantar fasciitis. The Wolverine Men’s Wolverine SD Mid Work boots are constructed with a tough, split suede leather and mesh upper that breathes to eliminate interior moisture and odor. 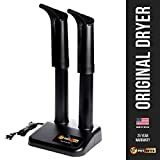 In addition, they feature a removable cushioned footbed and static-dissipating steel toe that prevents shock plus provides adequate protection from impacts and compression. The slip resistant outsole prevents slippage on wet surfaces, plus provides oil and abrasion resistance as well. Comfort is provided by the EVA midsole comfort cushion and the durable fiberglass shank that molds to your heel and arch area to provide flexible support to the areas that require it most. An easy lace-up feature allows you to adjust the comfort and support of your boot, which is necessary for those with plantar fasciitis. This particular work boot features a soft toe but is available with a safety toe if you require it. The Men’s 2nd Shift Plain Soft Toe Boot is constructed with a full-grain leather upper and man-made sole. The leather lace-up shaft measures approximately 6” from the arch and is also equipped with an adjustable circumference for personalized comfort level and support. Furthermore, a padded collar is incorporated in the construction and provides additional comfort around the ankle. The nylon mesh lining wicks away moisture to keep the interior of the boot sweat-free. During varied temperatures, a removable sock liner keeps your feet cool in warmer temperatures and warm during cold weather, even in snow and rain. A rubber outsole with aggressive grip that clings to various surfaces. These Cat work boots are ideal for those who spend a lot of time on their feet or on hard surfaces. Since a boot that provides adequate arch support which is necessary for those with plantar fasciitis, the Rigmaster Steel Toe 8” work boot is constructed out of waterproof full grain leather with an adjustable circumference for an individualized fit. 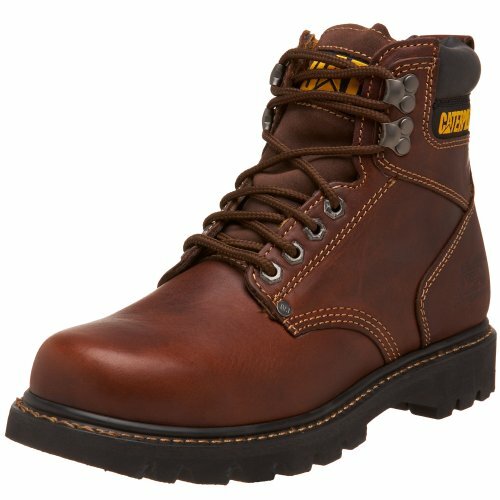 This particular boot offers a roomier steel toe that is rated ASTM F2413-05 and an electrical hazard rating of 095553214. Furthermore, the ladder lock non-slip outsole with multi-directional triangular-shaped lugs grips surfaces aggressively and keeps your feet securely on the ground. They are water, oil, heat, and abrasion resistant, which is an important feature if you’re working as a mechanic or a welder. For comfort, these boots are equipped with an anti-microbial, contoured, single-density, Ortholite footbed and an anti-fatigue midsole. The NATO speed laces allow you to easily adjust the support level and ensure a secure fit, plus, the convenient leather tab located on the back of the boot assists in pulling them on and off. 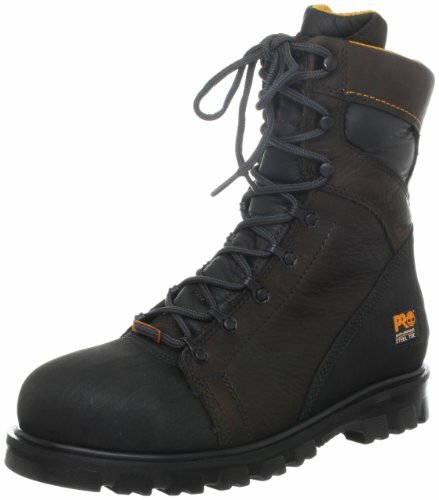 The Men’s Steel Toe Raider Boot is another work boot that would be ideal for those with painful plantar fasciitis as it features specific comfort technologies such as a nylon shank for arch support where you need it, multi-shock compression pads that are molded in the outsole, and a removable cushioned footbed. All of these features are designed to create extra padding, support and absorb the shock from walking on hard surfaces. 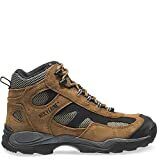 In addition, the Steel Toe Raider Boot is constructed with a moisture managing mesh lining that wicks away moisture from long wear and reduces odor. For safety, a round steel toe is incorporated in the boot and protects against impact and compression. 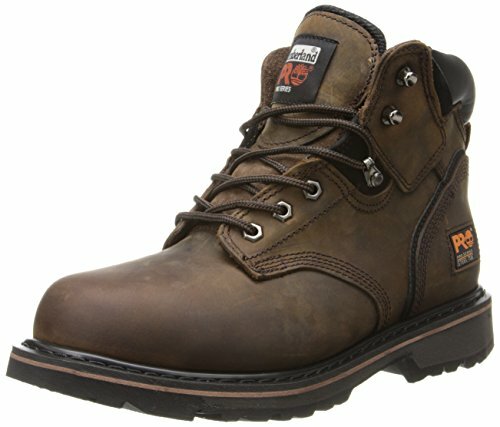 These particular work boots are manufactured out of full grain leather, with a matching leather lace up shaft. A padded collar provides additional comfort to your ankles. For someone who is constantly treading on hard surfaces, such as a warehouse or factory, the Raider Boot would be an ideal choice. Check out our other reviews of steel toe work boots. Timberland make some very comfortable and durable work boots designed for the hardworking man, and the Pitboss 6” Steel Toe Boot is no exception. 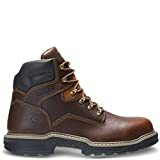 These rugged leather lace-up boots with tonal stitching adjust easily for a secure fit, and the padded collar provides extra cushioning to your ankle area. A removable sock liner prevents rubbing and lessens the possibility of blisters. In addition, the roomier than average steel toe meets ANCI standards and doesn’t restrict the movement of your toes. The synthetic sole offers ample traction and grip to prevent slipping on wet and oily surfaces. The electronic hazard protection allows for a safe working environment around electronic sources. Another important feature is the antimicrobial fabric lining that prevents odors by allowing your feet to breathe properly during long extended wear. In laments terms, Plantar Fasciitis is a painful foot condition stemming from an over-strained ligament called the plantar fascia. This ligament is a flat band of tissue that connects your heel to your toes; its primary function is supporting the arch of your foot. When it is damaged or strained it can cause severe pain in your heel or bottom of your foot while standing or walking, especially on hard surfaces such as concrete, and asphalt. Sometimes, you can further injure your plantar fascia by wearing incorrect footwear that doesn’t support that particular area or provide comfort. Additional injury can consist of actual tears in the ligament itself, which can’t heal properly if not taken care of. You’re more apt to contract Plantar Fasciitis if you have high arches or flat feet, walking or standing on hard surfaces for long periods of time, and wearing footwear that doesn’t fit well or has become worn out. In addition, weight can also be a contributing factor because of the added strain and pressure that is placed on that ligament. As I mentioned before, this particular ligament supports the arches and will only allow for so much flex before it breaks down. Sometimes, the effects of Plantar Fasciitis can be felt when you first start moving, and may gradually fade away with more movement, however, reversed, your feet might feel fine at the beginning of the day then worsen as the day progresses. It’s important to not ignore the signs your feet are giving you, as pain is an indication that something isn’t right. The proper shoe or work boot can make all the difference in the world to assist in preventing Plantar Fasciitis, or further inducing a pre-existing condition. Learn more from our reviews of some great shoes for standing on concrete. In the previous section we discussed what Plantar Fasciitis is and what were some of the contributing factors of this painful foot condition, and now we will provide information on how to prevent, and alleviate a pre-existing diagnosis. Did you know that even after a diagnosis of the condition, it can take up to 6 to 8 weeks before the pain is alleviated; months for total relief, and even longer if you don’t alter certain conditions of your lifestyle such as excessive weight, or ignoring telltale symptoms. One way to protect your feet from further damage is to invest in a good pair of work boots, the type that offers specific support and comfort for this condition. As we know, Plantar Fasciitis affects the arch of your foot, and it’s imperative to provide those arches additional support, especially if the ligament that is designed to support them is damaged. Another important factor is the outsole of the work boots; they should have a well-cushioned platform that alleviates the shock caused by walking on hard surfaces. In addition to work boots as a preventive or remedy, there are other ways to prevent an onset, or protect your feet from further damage associated with the condition. One of those ways consists of stretching the area known as the Achilles tendon, also referred to as the heel cord. After a long, hard day of work, stretching will stimulate the plantar fascia. In addition, applying ice packs to the painful area can reduce swelling. However, if pain continues it’s always a wise decision to consult with your physician or a podiatrist that can assist you with other treatments. Protecting your feet should be a priority as they are what keep you standing and allow you to perform your job efficiently. Not all work boots are designed alike; some of them have special features, and advanced construction to suit the needs of a person with Plantar Fasciitis or flat feet. The ligament that supports the arches is damaged so you require an artificial form of support that mimics the ligaments purpose. For this reason, we have come up with a list of features and specifications you should look for when purchasing a work boot. Contoured Footbed – A contoured footbed conforms to your foot naturally and takes on the shape of a healthy foot. It supplies proper cushioning in the areas of the foot and supports the arch efficiently by producing less strain on the ligament. Shock Absorbing Insole – A well cushion absorbs some of the shocks from walking or standing on hard surfaces, plus alleviates pressure from the weight being placed on your arches during your daily activities. Lower Heels – Choose a medium sized heel for your work boot, higher heels tend to cause unnecessary pressure and increased tension to the plantar fascia. Keep in mind, it’s essential to have some type of heel and not choose a flat outsole, as they would only be contributing to the problem. Lace-up Boots – Boots with a lace up feature are adjustable for support and are less likely to allow your foot and heel to slip, unlike zippers or pull-on work boots. 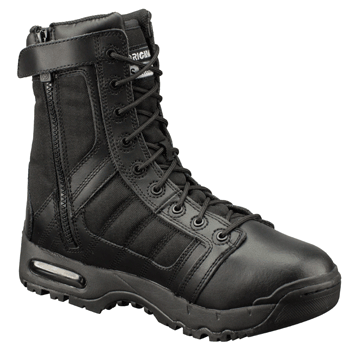 The additional support a lace-up boot provides will keep your foot where it needs to be. Orthotic Inserts – If boots are not already equipped with an orthotic insert, it’s highly recommended that you purchase them as they are designed for those with foot issues, plus, they can also alleviate back, knee, and leg pain as well. Having the proper work boot is essential to hard working individuals with this medical condition, or those who are prone to develop it, especially those who are on their feet constantly, performing their duties on hard un-giving surfaces. By taking care of your feet, you’re assuring yourself that you are doing everything possible for the prevention of Plantar Fasciitis. If you already have boots you love or found that your new boots still don’t provide enough support, then upgrading your insoles could be a quick and easy fix. Check out our recommendations for the top insoles for work boots. We certainly hope that we have provided you with valuable information that will assist you in selecting the best work boot for Plantar Fasciitis. As you have learned, it’s not a condition you want to develop or further aggravate. If you find yourself experiencing this type of foot pain, pay close attention to the symptoms and don’t let them go untreated. You are responsible for your feet, and only you can decide on how to protect them properly. Keep in mind; we pride ourselves in delivering quality, useful information, and reviews of only the top brands of boots. The research we put into each brand is beyond comparison. In addition, our intentions are not to promote, but to inform consumers such as yourselves of the choices available to you.